The subject line is frequently the first thing people see when they get a new email. As a marketer who relies on email marketing to drive interest and sales, this is an important fact to know. Because a good subject line may be the difference between someone opening your email and deleting your email. Way back in May, I wrote the Key to the Inbox, a short post on using email delivery services to get your marketing message out to your audience. But getting into the inbox is only the first battle in the war for consumers’ attention. When crafting a subject line, you want to convey the most value in the least number of words or characters. Because consumers will be using different email service providers, like Gmail or Outlook, to view their email, it’s impossible to say what the right number of characters is, but shorter will always be better. The reason is, your subject line will get cut off if it’s too long and won’t have the impact of a full and complete thought. Give the reader a reason to open the email. What’s in it for them? Is there a discount offer, or a deadline they need to know about, or some incredible new study they’re interested in? Explain it in the subject line to help insure that anyone who is interested in that piece of information opens the email to find out more. Equally as important as what to include in your subject line, is what to avoid. You’ll want to avoid use of the word ‘free’, and the overuse of symbols like dollar signs ($) and percentages (%), because email service providers see those as signs of spam. Also, avoid the use of personalization in the subject line, because that is common in many spam emails. The best advice that I can give is to be open and honest about what this email is about, but say it in a way that is impactful. 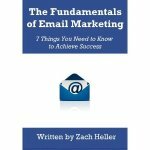 To learn more about writing subject lines that will guarantee more readers, and tons of other email marketing tips, check out my book, The Fundamentals of Email Marketing: 7 Things You Need to Know to Achieve Success.